The Zero-Footprint-PC ZPC-GX31 is a new example of a PC squeezed inside a keyboard. It's an ideal solution for those who don’t require a powerful PC or a gaming machine - or those who want a basic and small desktop machine that doesn’t take up too much room. 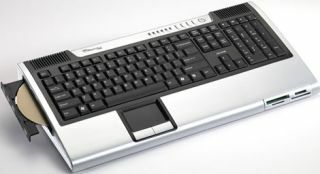 The ZPC-GX31 puts an Intel Core 2 Quad CPU inside a normal size keyboard, along with 4MB of DDR2/667MHz RAM, 1GB LAN, a DVD/CDRW optical drive and a DVI interface. It's described as “a complete personal computer that takes up no more space than a typical keyboard”. At $700 (£350) it’s quite a bargain. Just don’t try to play any games on it, other than solitaire!